* For the latest fashion in vintage wedding headpieces, Mariell presents our beautiful ribbon headband with Swarovski crystals. * This striking bridal headband features vintage scrolls accented with marquis crystals & gracefully draping rhinestones measuring 9" across. * The headband has 15 1/2" of soft satin ribbon on each side finished with beautiful Swarovski teardrop dangles on each end. * Our adjustable ribbon headband is shown in Ivory/Silver and is also available in White/Silver. 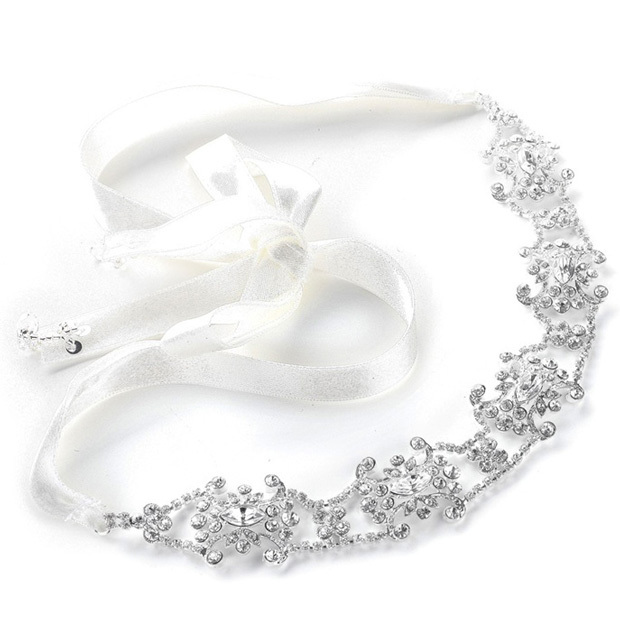 * This headband can also be worn as a beautiful bridal belt (40").